Self parking is recommended at the Walt Disney Concert Hall, located 1 block north of the Museum on Grand Avenue. Parking is a flat rate of $9/car after 5:00 PM. Cash only. 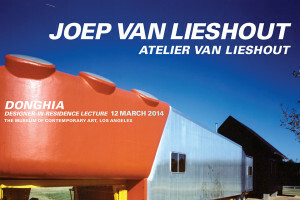 Dutch artist JOEP VAN LIESHOUT lives and works in Rotterdam, the Netherlands, and is the driving force behind ATELIER VAN LIESHOUT. Joep began as a solo artist, creating objects in brightly colored polyester-the material that would become his trademark-from the early 1980s onwards. In 1995 he founded Atelier Van Lieshout, undermining the myth of individual artistic genius. Atelier Van Lieshout (AVL) produces objects that balance on the boundary between art, architecture and design, encompassing sculpture and installations, buildings and furniture, utopias and dystopias. Recurring themes in the work of AVL are power, politics and autarky, as well as a fascination for life, its creation and its end in death. With this body of work, both autonomous and commissioned, AVL has attained international recognition. Over the past 25 years, AVL has exhibited at and/or been acquired by major art institutions and collections worldwide. AVL also produces commissions for and collaborates with architects such as Rem Koolhaas/OMA and MVRDV. This Lecture and Reception, and the associated Master Class at Otis College of Art and Design, are made possible through a generous donation from the Angelo Donghia Foundation. The ANGELO DONGHIA FOUNDATION, INC., a privately held not-for-profit organization created under the will of the late Angelo Donghia, provides support for two distinct fields: the advancement of education in the field of interior design and initiatives pertaining to the discovery of causes of AIDS and its related diseases, and their methods of treatment. This lecture was organized by the ARCHITECTURE/LANDSCAPE/INTERIORS Department at Otis College of Art and Design, which offers a synthetic curriculum of the spatial design fields.For information call 310.665.6867 or email ArchitectureLandscapeInteriors@otis.edu.